On March 29th, 1892 John Moses Browning was granted US Patent 471784 for a gas operated machine gun. 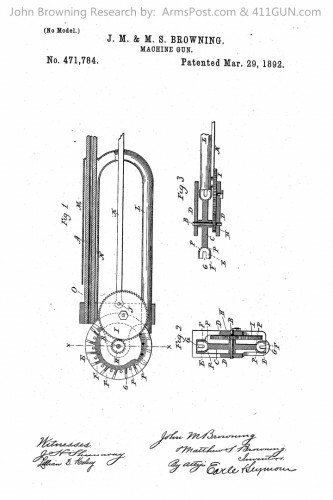 This Machine Gun Patent was applied for on August 3rd, 1891. This particular machine gun design is extremely unique. Based on the drawing it is using a rotating cylinder that moves in the opposite direction of what we are used to seeing in revolvers.